Thanet Life: Who Owes Who? 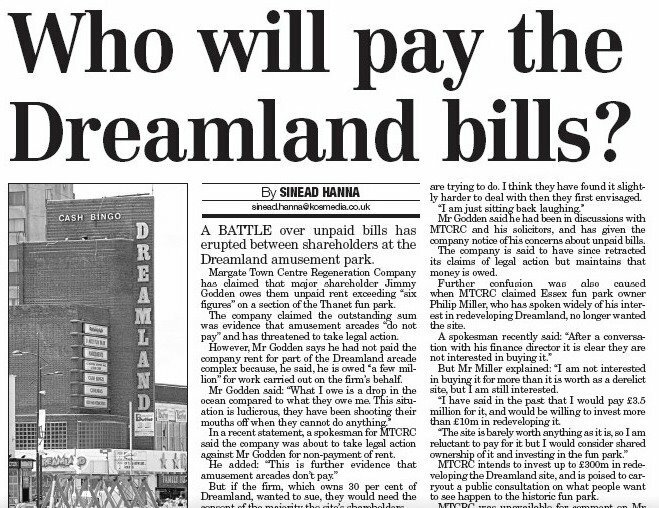 Kent On Sunday reports an argument between Margate Town Centre Regeneration Company (MTCRC) and Dreamland owner, Jimmy Godden over "Unpaid rent exceeding six figures" for the amusement park. 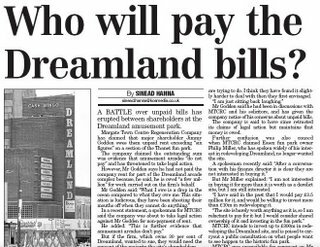 The argument appears to surround unpaid rent for the amusement arcades, with MTcrc threatening to sue, while Mr Godden claims he is owed: "A few million for work carried out on the firms behalf." My own uneducated guess is that this will end-up as yet another write-off. What do you think? Do we care, neither company is run with our tax money as far as I know, although one (MTCRC) has an official sounding name. Dreamland must be such a disappointment this year for our visitors.Its pathetic. I note the Big Wheel has not returned, what a pity, it added an attractive visual impact to the seafront. No wonder when TDC gave them a hard time about it. Also the Oriental Buffet has not reopened this summer, that was pretty popular with visitors and residents alike. Mr Goddden is just biding his time. Houses not an amusement park is what he wants. Another get richer scheme from him no doubt. He has no respect for the wishes of local residents and will probably win as the government too want new housing on "Brown fields". Lets see if I am correct.. I find it hard to have sympathy for either of these money grabbing people. Gooden and Hunter are one of a kind - only looking to make as much mone as possible. I'm glad there is a bit of in-fighting. Re the Big Wheel, Hunter (Waterbridge) demanded an massively increased rental for the Mr G's site so they did not return. Waterbridge didnt want the wheel there, it was doing too well. The whole situation stinks - the tenants at Dreamland have to be off site on Sept 4th so no opening at weekends til half term and no half term opening. They have just opened the main entrance and replaced the cinema fin sign due to pressure from the council (at long last) but all in time for the end of the season. The sooner compulsory purchase happens the better. Sounds a bit like a "falling out among *******"! I have found the name of Margate Town Centre Regeneration Company a cheek, quite frankly, giving the developers a quasi legitimacy they do not have. Let them argue amongst themselves and sue each other for all I care. What I would like to see is the enforcement order by TDC actually enforced in respect of the unsuitable security fencing (shown in Dr Moores pics at the start of the season)and TDC accepting that MTCRC are making no effort whatsoever to make a viable attraction of this site in order to develop it as per Option C! TDC, you need to compulsory purchase this site instead of wasting money on ex M&S! It was also made clear in the statement that it is now proved that arcades are not viable for the seafront!!!!!! DO NOT HOLD YOUR BREATH on this promise,let us all tell these two faced lying gits that they are wrong. Go with what you have and do not let big business or asset strippers destroy the things that we have or could have again. Southend has proved that there is a need for seaside entertainment and that it can be viable. I'm sure a nice little fire will solve all our problems! !